For a fortnight every May the town of Cannes in the French Riviera is descended upon by the great and good of the film industry for the Cannes Film Festival. Bigger and more cosmopolitan than St Tropez, prettier than Monaco, more yachtie than Nice, Cannes is home to some of the world's largest superyachts, fabulous shops and restaurants. 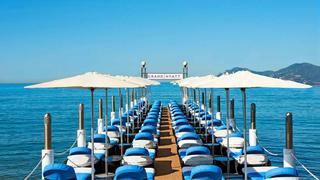 Where to berth for the Cannes Film Festival There are two marinas in Cannes — Port Pierre Canto and Port de Cannes. Port de Cannes, also known as Old Port, can host superyachts up to 65 metres, has a total of 60 superyacht berths, is right next to the Cannes Palais des Festivals and as a result is the location of choice for the Cannes Film Festival. The premium spots for the festival are in the inner harbour and this is where the celebrity yacht parties are likely to take place. Porto Pierre Canto is the larger of the two full-service marinas in Cannes and is positioned to the east of the town, at the far end of La Croisette. It is able to facilitate yachts up to 90 metres and there are 40 berths for yachts over 30 metres. For a fortnight every May the town of Cannes in the French Riviera is descended upon by the great and good of the film industry for the Cannes Film Festival. Bigger and more cosmopolitan than St Tropez, prettier than Monaco, more yachtie than Nice, Cannes is home to some of the world's largest superyachts, fabulous shops and restaurants. 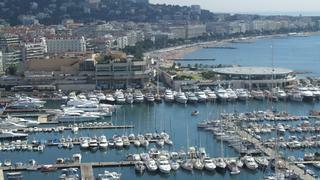 There are two marinas in Cannes — Port Pierre Canto and Port de Cannes. Port de Cannes, also known as Old Port, can host superyachts up to 65 metres, has a total of 60 superyacht berths, is right next to the Cannes Palais des Festivals and as a result is the location of choice for the Cannes Film Festival. The premium spots for the festival are in the inner harbour and this is where the celebrity yacht parties are likely to take place. Porto Pierre Canto is the larger of the two full-service marinas in Cannes and is positioned to the east of the town, at the far end of La Croisette. It is able to facilitate yachts up to 90 metres and there are 40 berths for yachts over 30 metres. Cannes is famously home to some of the best restaurants in the world to visit by superyacht. There are three Michelin two-star restaurants in and close to Cannes — the Palme d’Or at the Martinez Hotel, L’Oasis at La Napoule and La Villa Archange at Bastide Bruno Oger, which is only 10 minutes from the Croisette in Cannes. The Palme d’Or, on the first floor of the Martinez, is housed in an elegant Art Deco style dining room, with a large terrace overlooking La Croissette and the sea. The style is Mediterranean fusion with a menu full of complex and interesting flavours. L’Oasis is famed for its opulent, Romanesque-style gardens and fusion cooking. The setting really is quite wonderful. The Raimbault brothers are the brains behind the delectable Mediterranean food with an Asian twist and an exceptional wine list offers a stunning collection of Provençal wines. La Villa Archange is installed in an eighteenth century building and features a private courtyard, shaded by hundred-year-old trees. Its specialities include a frog and clam cappuccino with shallots and a veal knuckle slow-cooked for 24 hours. If you are looking for a more rustic experience then head to the Aux Bons Enfants. The same family has run the restaurant for three generations and the menu is dependant on what is available from the market that day. Be aware that you can only pay by cash and reservations are not taken over the phone. 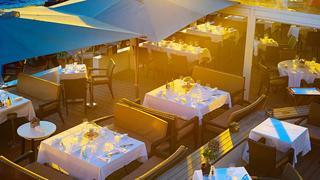 Cannes is famously home to some of the best restaurants in the world to visit by superyacht. There are three Michelin two-star restaurants in and close to Cannes — the Palme d’Or at the Martinez Hotel, L’Oasis at La Napoule and La Villa Archange at Bastide Bruno Oger, which is only 10 minutes from the Croisette in Cannes. The Palme d’Or, on the first floor of the Martinez, is housed in an elegant Art Deco style dining room, with a large terrace overlooking La Croissette and the sea. The style is Mediterranean fusion with a menu full of complex and interesting flavours. L’Oasis is famed for its opulent, Romanesque-style gardens and fusion cooking. The setting really is quite wonderful. The Raimbault brothers are the brains behind the delectable Mediterranean food with an Asian twist and an exceptional wine list offers a stunning collection of Provençal wines. La Villa Archange is installed in an eighteenth century building and features a private courtyard, shaded by hundred-year-old trees. Its specialities include a frog and clam cappuccino with shallots and a veal knuckle slow-cooked for 24 hours. If you are looking for a more rustic experience then head to the Aux Bons Enfants. The same family has run the restaurant for three generations and the menu is dependant on what is available from the market that day. Be aware that you can only pay by cash and reservations are not taken over the phone. The Boulevard de la Croissette, the road that runs along the seafront, is undoubtedly the place to head if you are in search of haute couture fashion and fabulous shoes. Here you can find all the luxury brands (Chanel, Dior, Saint Laurent, etc) cheek by jowl, with price tags that reflect the desirability of their location. More modest shopping can be found on Rue d’Antibes and the fabulous Forville market in the Place du Marché Forville is the place to go (or to send the chef) for wonderful Provençal provisions. Plage du Martinez, opposite the Grand Hyatt Cannes Hôtel Martinez, is the place to head if you want to spend some time loafing in the sun (or shade) by the sea and enjoy a wonderful alfresco lunch. A place on the pier is most sought-after, with more room and better service. For an afternoon at the beach, cooled by sea breezes and served by some very smartly-attired staff, there are few better places. 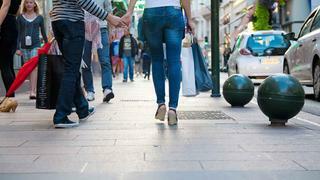 With a population of a little over 70,000 Cannes is a small compact city meaning that most places are accessible by foot. The traffic in the city centre can be a nightmare during the festival so you are often best to go by helicopter. 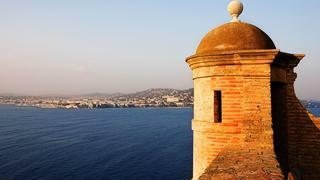 The Iles de Lerins, just off the coast of Cannes, is definitely worth a few hours of your time. The two main islands are Île Sainte-Marguerite and the Île Saint-Honorat. Saint-Honorat is home to a monastery that dates back to the fourth century and the Île Sainte-Marguerite held a fortress where The Man in the Iron Mask was kept captive for a time. On the mainland, the Centre d’Art La Malmaison in Cannes is worth a visit. Originally part of the Grand Hotel, the Centre d’Art La Malmaison now houses regular exhibitions of works by some very famous artists, including (in recent times) Picasso, Ozenfant, Matisse and Miro. The Iles de Lerins, just off the coast of Cannes, is definitely worth a few hours of your time. The two main islands are Île Sainte-Marguerite and the Île Saint-Honorat. Saint-Honorat is home to a monastery that dates back to the fourth century and the Île Sainte-Marguerite held a fortress where The Man in the Iron Mask was kept captive for a time. On the mainland, the Centre d’Art La Malmaison in Cannes is worth a visit. Originally part of the Grand Hotel, the Centre d’Art La Malmaison now houses regular exhibitions of works by some very famous artists, including (in recent times) Picasso, Ozenfant, Matisse and Miro.